Authorities continue to demolish the residents of monks and nuns, following an order issued by the Chinese government a few weeks ago to dismantle a significant part of the Tibetan Buddhist Academy in Sichuan. Moreover, according to sources on the ground, academy residents have been harassed and forced to undergo political education. As Chinese work crews continue to demolish dwellings at Sichuan’s Larung Gar Buddhist Academy, authorities are forcing many monks and nuns living at the academy back to their family homes in the neighboring Tibet Autonomous Region, sources in the region say. The move supporting China’s plan to reduce the size of the sprawling complex has been aimed so far only at residents coming from the TAR prefectures of Lhasa (in Chinese, Lasa), Ngari (Ali), Nagchu (Naqu), and Chamdo (Changdu), a local source told RFA’s Tibetan Service. “The family members of monks and nuns from these areas in the TAR have been ordered to come to Larung Gar to take their relatives home,” RFA’s source said, speaking on condition of anonymity. Monks and nuns native to Tibetan-populated areas of China’s Sichuan, Qinghai, and Gansu provinces have so far not been subject to the expulsion order, he said. “But monks and nuns coming from Driru [Biru] county in Nagchu were among the first forced out,” he said. “They were warned of ‘consequences’ to their families in Driru if they refused to leave, including their right to collect cordyceps,” a fungus highly valued for its medicinal qualities and an important source of income. Tibetans in Driru, a county considered “politically unstable” by Chinese authorities, have long resisted forced displays of loyalty to Beijing, which has imposed tight restrictions in the area for the past several years. Many thousands of Tibetans and Han Chinese study at Larung Gar, which was founded in 1980 by the late religious teacher Khenpo Jigme Phuntsok and is one of the world’s largest and most important centers for the study of Tibetan Buddhism. 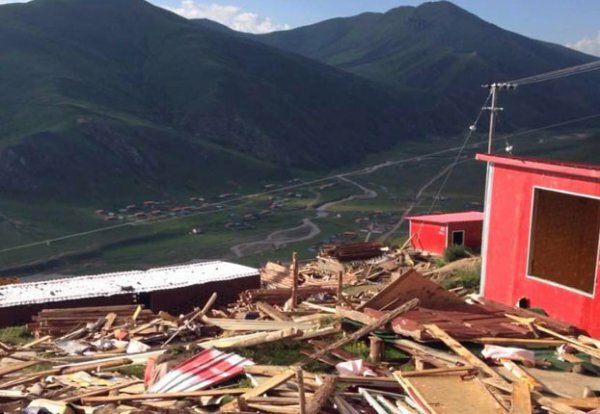 Monastic leaders at Larung Gar have urged the institute’s monks and nuns not to resist the destruction of their homes, and the work is believed to have gone ahead so far without interference, though one suicide has been reported. “Despite the heartbreaking scenes of the demolition of their houses, the monks and nuns at Larung Gar are exercising patience and restraint and hoping for the Buddhist institute’s survival,” RFA’s source said.